This article follows up the previously published "Primer: Understanding Hoarding Behaviour in a SFC Model." In that article, I demonstrated what would happen if we modify the simplest model in Godley and Lavoie's Monetary Economics ("model SIM") to allow the the business sector to have a non-zero profit margin. That version of the model was broken, as the business sector hoarded the profits, creating a perpetually-growing stock of financial assets held by the business sector. In this version of the model, the business sector pays out all profits as dividends, allowing us to divide the household sector into business owners (capitalists) and workers. The chart above shows one way we can use the model -- simulate the varying effects of tax cuts. I will discuss the details further below, but I will now briefly summarise what is happening in the simulation. Following typical Keynesian assumptions, capitalists have a lower propensity to consume (out of income as well as financial asset holdings). The multiplier on government spending is just under 5 (the steady state GDP is roughly $91, while government consumption is fixed at $20). 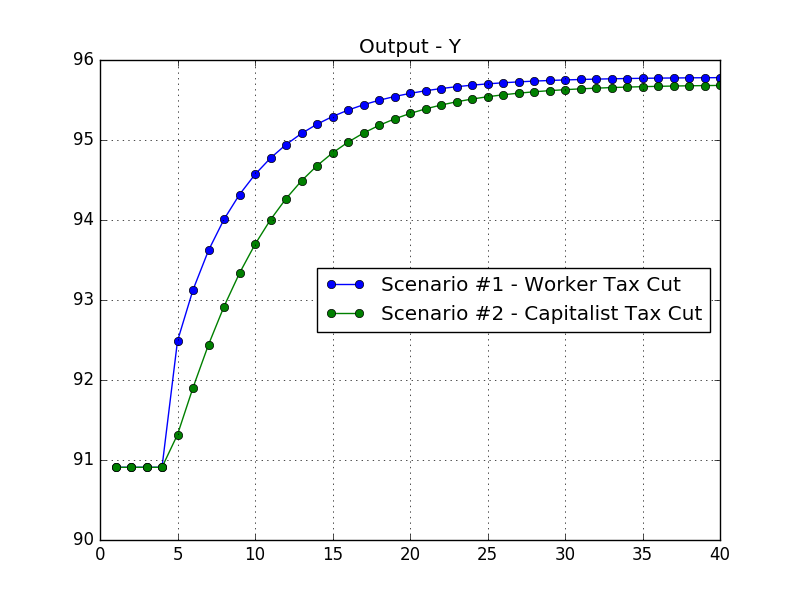 The first scenario is generated by giving workers a tax cut that cuts government revenue by $1 (using static revenue assumption). The second scenario is generated by giving business owners a $1 tax cut (under static revenue assumptions). As can be seen in the above chart, GDP converges towards roughly the same steady state level in both scenarios. (The fact that scenario #1 has a slightly higher level might be an artefact of rounding assumptions, and is not viewed as meaningful). However, in the short run, Scenario #1 exhibits a more rapid growth of GDP. It must be immediately noted that free market-oriented "supply side" economists would object to these results. The counter-argument is that by aiming tax cuts at businesses, it would induce additional investment, and boost long-term growth rates (since the capacity of the supply side is presumably increased by increased investment). This ends up being a very ideological debate that I do not expect to resolve. However, I would note that the model that I am looking at makes such a determination impossible. The model is extremely simple, and it is entirely demand-driven: there are no supply side constraints within it whatsoever. (As tax rates tend to zero, output tends to infinity.) Therefore, within the context of this model pursuing the debate makes no sense; we need to look at a model with capital accumulation. Therefore, the discussion here is not meant to be interpreted as policy advice. That disclaimer aside, I think the results are roughly reflective of real world behaviour; in the short-term, we need to look at the effect of fiscal policy from a demand-driven perspective. The usual way of modelling the household sector would be to lump the two sub-sectors into a single mass. My concern with this is that we probably need to differentiate the income streams in order to get a more realistic model, which means that we are effectively breaking up the household sector within the equations anyway. The initial steady state has the following characteristics (all numbers are rounded). The worker sub-sector has a pretax income of $72.73, and pays $14.545 in taxes (tax rate of 20%). The capitalist sub-sector has a pretax income of $18.18, and pays $5.455 in taxes (tax rate of 30%). The government always runs a balanced budget in a steady state, and total tax revenues of $20 matches fixed ("exogenous") government consumption spending ("G"). For Scenario #1, the tax rate for workers was dropped to 18.6%, which lowered the static tax take to be close to $13.545 (off as a result of rounding). For Scenario #2, the tax rate for capitalists was dropped to 24.5%, which lowers the static tax take to be $4.45. Since the profit share was assumed to be fixed at 20%, the aggregate worker pretax income is 4 times the pretax value of dividends. Correspondingly, the tax cut for dividends has to be much larger in order to generate the same $1 in tax cuts. Although the models I have so far developed are quite simple, they allow us to understand some of the underlying dynamics that will show up in more complex models. The current example shows why Keynesian economists emphasise the differentials in the propensity to consume by different classes of households.